Mangosteen, Certified Organic - 32 oz. Mangosteen (Garcinia mangostana), known as the "Queen of Fruits", has been treasured for thousands of years in Southeast Asia. It has been part of a traditional diet and known for its health promoting properties. More recently, scientific inquiry has revealed the extraordinary properties of Mangosteen due to its characteristic combination of potent free radical quenchers called Xanthones. Mangosteen has a number of Xanthones and Proanthocyanidins. These powerful compounds help to neutralize and eliminate free radicals, and thus support healthy cellular function. 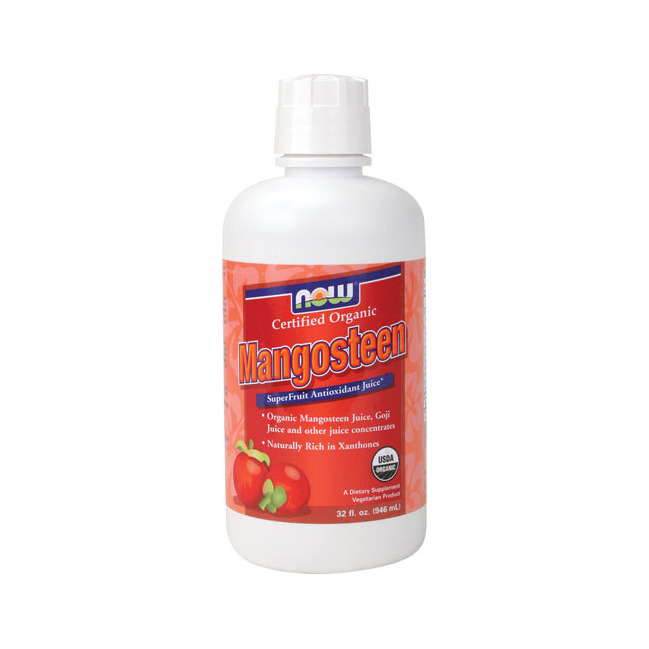 NOW® Mangosteen SuperFruit Juice also contributes Goji Juice, and concentrates of Pomegranate, Blueberry, Cranberry, and Black Cherry which boost the ORAC (Oxygen Radical Absorbance Capacity) value to over 19,000 per bottle. Some scientific evidence suggests that the compounds in Mangosteen may support cardiovascular health, as well as a healthy response to biological stress. As a dietary supplement, take 2 tablespoons (1 fl. oz.) daily, preferably in the morning, or as directed by your health care professional. Shake well before using. Refrigerate after opening. Keep out of reach of children. Organic Mangosteen Juice from whole Garcinia mangostana fruit, Organic Black Cherry Juice Concentrate, Organic Goji Juice from whole Lycium barbarum fruit, Organic Pomegranate Juice Concentrate, Organic Cranberry Juice Concentrate, Organic Blueberry Juice Concentrate, Citric Acid and Natural Organic Mangosteen Flavor..
NOW® Mangosteen Juice delivers the natural nutrient profile found in Genuine Whole Foods. Tamper Resistant: Do not use if safety seal has been broken.